The main objective of feed water heater is to heat feed water with the help of steam extracted or bled from the various intermediate stages of the turbine. This heating arrangement of feed water is called regenerative feed water heating and the heater known as regenerative feed water heater. 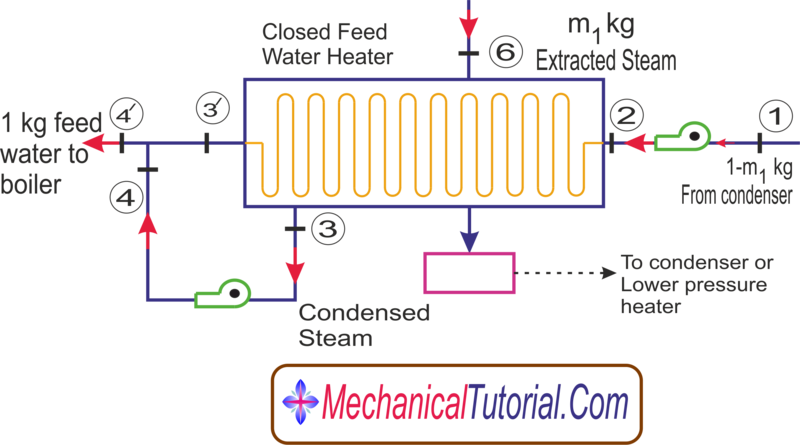 Regenerative feed water heater improves thermal efficiency.It protects the condenser by removing air which leaks the condenser.It is necessary to prevent corrosion into the boiler.In this page, we are going to discuss the different types of feed water heater and their heating arrangements. In open feed water heater, extracted steam is mixed with feed water at the same pressure and closed feed water heater, steam does not mix with feed water. There is a heat exchange between the two fluids at different pressure. 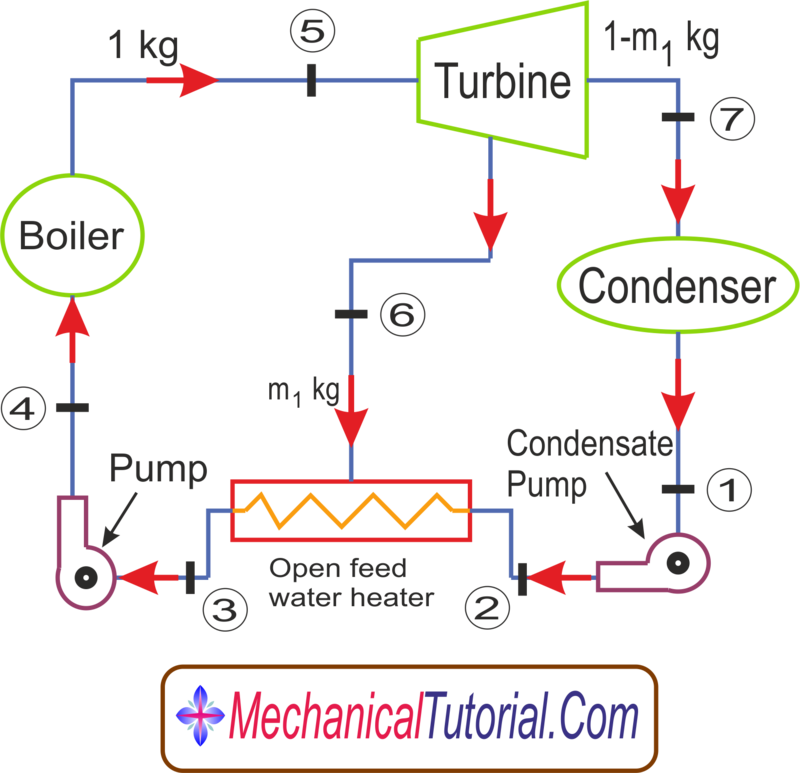 The above diagram shows regenerative type open feed water heater. Assume 1 kg of steam leaving the boiler and entering the turbine. Suppose m1 kg of steam is extracted or bled from the turbine at the intermediate pressure. During expansion from 5 to 6, 1 kg of steam is flowing through the turbine and (1-m1) kg is flowing through the remaining part of the turbine at the expansion from 6 to 7. In open feed water heater, pump release (1-m1) kg feed water at point 2 which is mixed with m1 kg of extracted or bled steam at point 6. Now this mixing fluid is saturated water at point 3 position with intermediate pressure p6. The m1 of steam can be found by SSSF energy equation. 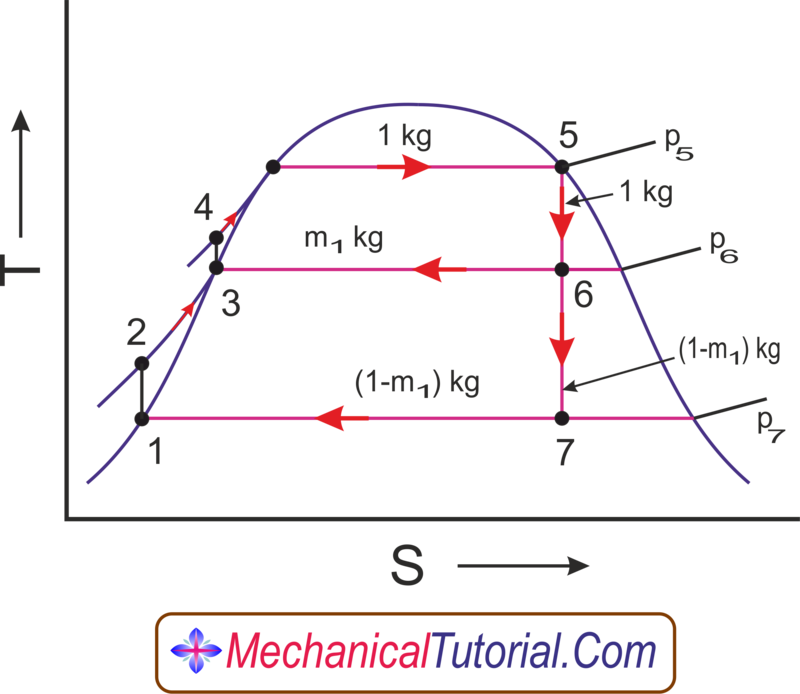 It is seen from the above equation that feed water enters the boiler at a higher temp T4 in place of T2. Since qh is reduced,wT and qL both are reduced.So, overall thermal efficiency of feed water nth is increased. We can increase the thermal efficiency by adding feed water heater in this cycle. It rise T4 and nth. But adding feed water will increase the initial capital lost of any plant. Not only that, pressure drop in heaters,piping etc may offset the gains in thermal efficiency.as many as eight no of feed water is used today in major plants. The point 3, 3/, 4, 4 coincide each other from same temperature and entropy. Design and construction is simple both open and closed feed water heater. One additional pump can be used for both feed water heaters for condensed steam. But in closed feed water heater, the condensed steam can be eliminated by the use of a steam trap and throttle valve shown in the diagram. It allow to pass only liquid not vapour.